Our Future Rooted in Our Past: Is it a Case of Street Racing or Road Rage in 1693? or Road Rage in 1693? Street Racing and Road Rage are very common terms in our modern day society, especially here in Southern California. We can read about these problems in the newspaper or watch the actual event on newscasts one of the multiple video websites like youtube. Their punishment was branding where they would either be branded on the cheek or thumb with the letters "F" - Felon, "M" - Murderer, or "T" for theft. I posted previously in of May 2007 regarding the LCCC or The Proceedings of Old Bailey London. At the time of the post, only the transcribed information was available for viewing. The site now contains accounts from the Old Bailey Proceedings from 1674 to 1913, and of the Ordinary of Newgate's Accounts, 1690 to 1772. The site has over 210,000 trials and biographies for approximately three thousand men and women at Tyburn. All of the proceedings have been extracted and have viewable original documents, free of charge; please note that when viewing the original documents, the writing style is an older English where the "s" looks like a "f". Usually this does not pose a stumbling block as you can generally understand the wording as long it is read in context. At first glance you might think that this site would have only information regarding the criminal aspect of the time, I was pleasantly surpised to find information regarding various communities including Jews, Huguenots, Chinese, Gypsies and other Travelers to name a few. The information provided under these various communities helps to elucidate the migration patterns, employment, and challenges of each group. One of many other reasons to visit this site is that there is a glossary provided that defines the terms of the various crimes and punishments for the time period. Do you have an ancestor from that may have lived in England that you just haven't been able to find from the time period of 1674 to 1913? One that you have traced through several census or parish records and then all of a sudden they vanished? Maybe they were one of the people accused of road rage or street racing in their day and time. You also just might find one of your family members as a victim or witness in one of the crimes of the day. 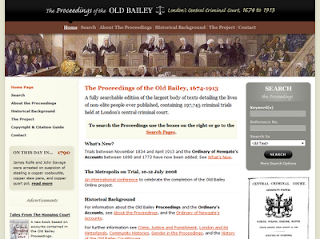 If you have hit a brick wall in your research, you might want to look on the harsher side of life during these time periods by searching Old Bailey Online. Have fun!